Okay, so the original details of what happened are here. Long story short, North Carolina created fake classes and had academic advisors tell their student athletes to take these fake classes to boost their GPA. The NCAA conducted a year-long investigation of UNC and the improper benefits given to their athletes, and completely missed this. A newspaper found out about the internal review UNC did (to find the department with the fake classes), and in less than a month of investigating, the NCAA concluded on August 31st that the no-show classes were not against their rules. Wait, what? How can you possibly go through and investigate North Carolina, after the story came out that they had serious academic fraud and claim that there is nothing wrong? That there were no NCAA violations? Seriously? Is this a cover-up because they missed this the first time around? Penn State didn’t have any NCAA violations and they got hammered, but a school that had 54 (potentially 58, there is some discrepancy on the number) fake no-show classes for their student athlete’s to take, and the academic advisors told them to take them, didn’t garner any extra punishment? And they’re already serving punishment as we speak?? They seriously had the grounds to give North Carolina the Death Penalty, at least more so than Penn State. Penn State’s football program is on life support because of the actions of FORMER employees, while UNC has current employees helping with the academic fraud. Setting up fake classes for your student athletes is the DEFINITION of lack of institutional control. Yet, the NCAA did nothing. This tax-exempt, multi-billion dollar organization makes the rules up as it goes along. They literally choose to find, or not find, whatever violations they want. This is the biggest academic fraud case in the history of the NCAA and nothing happened. There were 18 student athletes involved in the scandal that are still in school and playing sports. Bobby Bowden had to forfeit wins at Florida State because students were cheating, so what in the hell is the NCAA doing just sitting on their thumb this time around? The NCAA took away an entire season from Memphis’ Basketball records because there were some alleged issues with Derrick Rose’s transcript, even though they had no proof. The UCONN men’s basketball team is banned from the 2013 NCAA tournament because of poor graduation rates. Thankfully the UCONN Athletic Director called out the NCAA and said it’s a complete double-standard. Why does the NCAA not have any balls? Do they think that nobody will notice that they just completely and utterly make drastically different and inconsistent enforcement of their rules? This is Pandora’s box of NCAA Scandal’s and they want to sweep it under the rug and say that they didn’t find any additional violations. It’s embarrassing at this point. It makes you wonder what will happen to the U. After all this investigating, will they even find anything that they can punish them for? Or will they merely let things be swept under the rug. Or what about Southern Cal? It just came out a few days ago that former USC runningback Joe McKnight and former USC basketball player Davon Jefferson received cash and benefits worth over $1,000. The NCAA investigated McKnight in 2009 and finished the investigation, only to determine there weren’t any benefits given to him. So why do these new stories keep popping up with different conclusions than what the NCAA found? Are there simply not enough investigators and they miss stuff? Or are they that bad at their jobs? Or do they know what is happening and choosing to overlook it? At what point will these questions be answered? My guess is probably never. These are the types of things where the answer will probably never be found and we will merely have to continue speculating. The more news that comes out with the NCAA having to investigate schools for things they already looked at will look even worse. This makes their harsh action against Penn State look completely ridiculous and blown out of proportion. A school is giving athletes grades for classes with no homework or tests. But there is no NCAA violation? 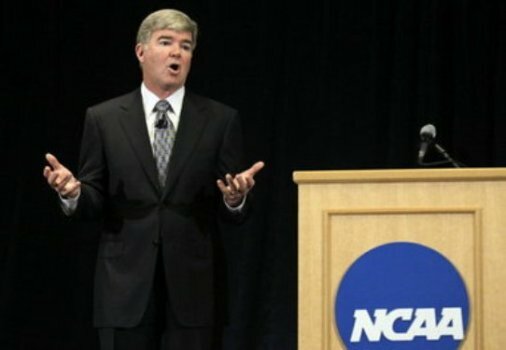 NCAA President Mark Emmert says that this is their mission statement, “Our mission is to be an integral part of higher education and to focus on the development of our student-athletes.” Quite honestly I don’t see how this can possibly be their mission statement with the messages they keep sending out with their “investigations.” All I know is, these kids won’t be going pro in something other than sports if they don’t get a proper education, that is for damn sure. Some other good articles: here and here. This entry was posted in College Football, College Sports and tagged Bobby Bowden, Davon Jefferson, Derrick Rose, Florida State, Joe McKnight, Mark Emmert, Memphis Tigers, NCAA, NCAA President, NCAA Violations, No Punishment, No Violations, Scandal, UCONN Basketball Probation, UNC No Show Classes. Bookmark the permalink.